Lost In My Prom Fairytale, written by Cathy Garcia, is the story of a young lady and her preparations for her prom night. 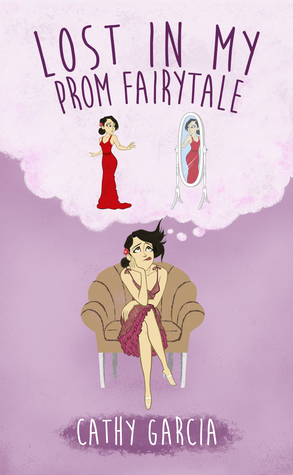 The story follows young Gia through all her internal monologue and detailed prom prep. It’s a short story, so there are not a lot of supporting characters. Gia briefly speaks of her girlfriends, and the boys she decides between for a date, as well as her mom and sister who ultimately help her get all her prep in order. Of course there is one catastrophy that occurs on prom day that causes Gia some serious angst, but I won’t spoil that plot point here. You can’t have a good story without some sort of conflict! This short novel was written for a young adult audience. As a grown woman who went to 2 proms I don’t really identify with this character. She’s a bit too wrapped up in all the details – ego-centric comes to mind. However I was not one to plan out my proms down to the moment. I’m sure there are a lot of young ladies out there who would identify with Gia’s character. If Emma takes an interest in reading this book I’ll add her thoughts to this review! If you’re looking for a cute short story, and you’re into inner musings, this may just be the story for you. It would also work as a checklist of things to think about in the lead up to planning your own prom experience. Sounds like a nice read for younger ones Jess. I’m quite jealous as we never had proms back at school. They didn’t start having them over here until years after we had left high school. Really? I went to two but only found them “okay”. I was not much of a social butterfly, and no boyfriends during my highschool year, so it was just fun to dress up and hang out with my friends. Maybe that’s why I didn’t quite identify with this book!